One this men, women and kids have in common they all love pizza and now there is a t-shirt for the whole family that just shows how cool pizza is. 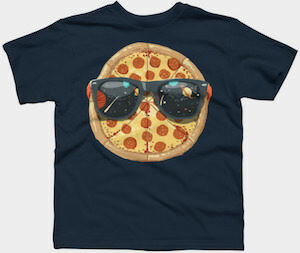 On this t-shirt you can see a pig pepperoni pizza and it’s wearing sunglasses as it is cool you know. You can get this pizza t-shirt in many fun colors and sizes so that men, women and kids all can make the perfect pizza t-shirt for them and yes it is made from 100% cotton and if you are lucky the pizza sauce didn’t drip down on the shirt.